Baci di Dama is a type of Italian cookie that is perfect for romantics. The name means “Lady’s Kisses,” and probably comes from the fact that these bite-sized cookies are simple, sweet and satisfying. 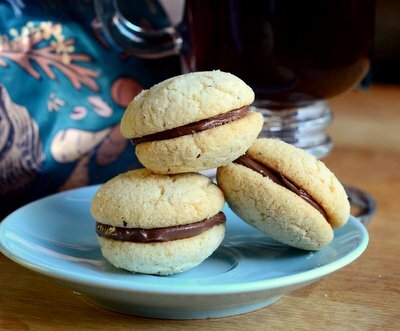 The cookies are a kind of hazelnut shortbread sandwich cookies that are filled with dollops of chocolate that add a little extra richness to the cookies and hold the halves together. The dough for these cookies is a shortbread-like dough made with hazelnuts, butter, sugar and flour. It can be whipped up in the food processor, so it only takes a couple of minutes to put everything together once you have all your ingredients in place. They bake up to be crisp and tender, with a melt-in-your-mouth texture that is quite addictive. The combination of butter, toasted hazelnuts and vanilla is good in any form, but when you add a little bit of chocolate, it takes them over the top. I always temper the chocolate before filling the cookies (brief instructions below) which allows the chocolate to set quickly without the need for refrigeration. You can also fill the cookies with a little smear of Nutella, which is a softer filling that still ties in nicely with the flavors of the cookie rounds. The balls of dough should spread nicely in the oven to form pretty half-rounds that can be paired together to make almost spherical finished cookies. You may have a cookie or two that falls flat in the oven and this is usually because there was too much butter in that ball of dough, meaning that your ingredients were not all thoroughly combined. If this happens, don’t worry because those flat cookies will still taste just as delicious as their slightly puffier compatriots. In the bowl of a food processor, combine hazelnuts and confectioners’ sugar and pulse until hazelnuts are very finely ground. Add in butter, salt and vanilla and pulse until mixture is sandy. Add in all purpose flour and whizz until dough comes together into a smooth ball and all ingredient s are well-combined. Shape dough into 1/2-inch balls and place onto prepared baking sheet, leaving at least 1-inch between them to allow for spread. Bake for 14-16 minutes, until cookies are set and very light golden around the edges. Allow cookies to set for 2-3 minutes on the baking sheet, then transfer to a wire rack to cool completely. When cookies are cooled, match them up into like-size pairs. Place coarsely chopped chocolate in a small, microwave-safe bowl. Melt the chocolate in 30-40 second intervals in the microwave, stirring well between each heating period, until the chocolate is almost completely melted. When 75% of the chocolate is melted, stop microwaving and continue stirring until all piece of the chocolate are melted (the warmth of the melted chocolate will continue to melt the chocolate, tempering it). Transfer chocolate to a piping bag and pipe a small amount into each pair of cookies then press them together to seal. Allow chocolate to set before storing in an airtight container or serving. Makes about 70 cookies; 35 baci di dama.